Emilia Redgrave just released a new suit. Well, i should say a full suit pack, as it’s generous in options and layers. 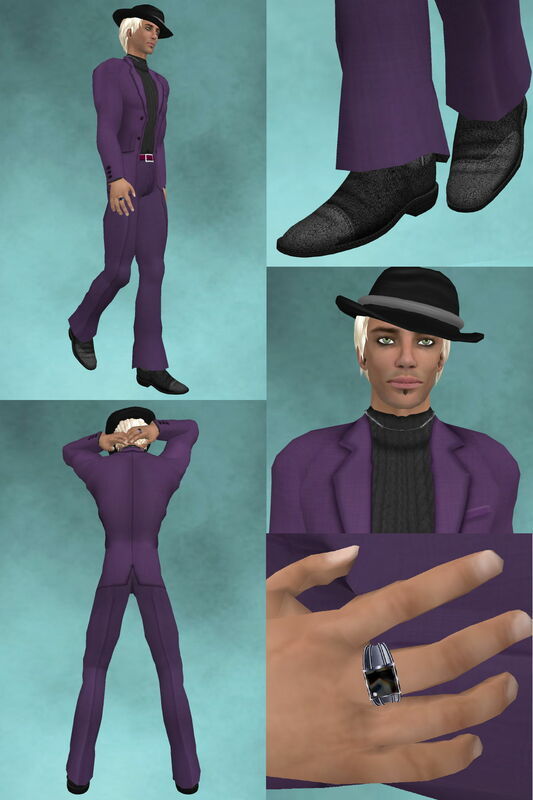 The “Suit Elegance” comes with a pair of black pants on the pants layer, a jacket in three versions on the jacket layer: jacket alone, jacket with shirt, jacket with shirt and vest; a vest on the jacket layer in two versions, long and short, and on the shirt layer, a dress shirt on the jacket, shirt and undeshirt layer, plus complement on the underpants layer, a sleeve puffer on the shirt layer (to wear with the jacket over it - no more ugly tight jacket’s sleeves YAY! ), and a few attachments: Jacket foulard, Pocketwatch, a pair of cuffs for the jacket, a pair of cuffs for the shirt, two versions of the tie: one to wear with the vest, one to wear with the jacket. Wow! The textures are sophisticated, especially for the shirt and vest (this vest is simply gorgeous). The black pants lack a bit of highlighting to give them some life under SL light, but at least it avoids the jagged bottom pants bug! 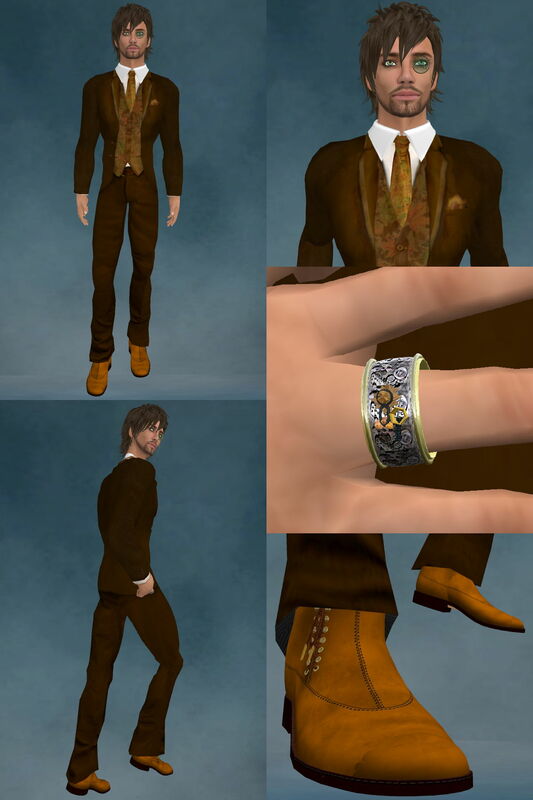 I’m showing the cuffs on the composite, but you can choose to wear “Suit Elegance” without them. I particularly like the jacket’s cuffs. I’m less convinced with the shirt’s ones, but, as they’re optional, everyone will follow their own taste! The watch is nice, works on the jackets or on the vest. The foulard is a cool addition. The ties, done to match both vest or jacket over a shirt is a nice idea, i just wish for a better adjustment to the clothing layer. When you pay 1200 Lindens for a suit, you can be demanding, right? Anyway, this suit is a great addition to any wardrobe. When you wear it, the whole ensemble looks really great, and even stunning, and I’m sure it wil be a success. Every piece of the pack is moddable, as every good house does. 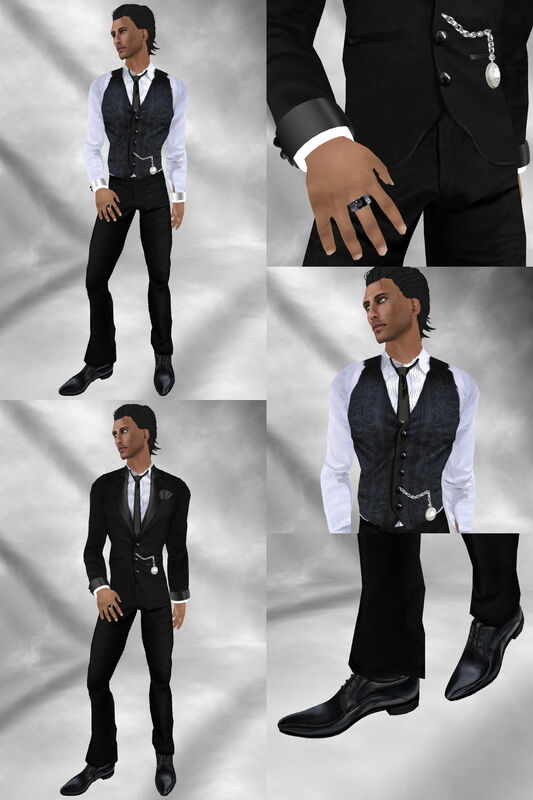 More rare, “Suit Elegance” is no copy, transfer, so easily giftable! Ladies, think of it if you are fed up with your man wearing skull stained tees! To go along with this very elegant suit, i chose to show you the new “Elegance Shoes” from Redgrave as well! Sculpty work, nicely textured, very realistic and shiny, they bring to SL something of this Italian style which is sometimes a bit show off, but always irresistible! They come in 6 colors; “Black” was the best choice for this outfit. These very original shoes (speaking of SL of course!) have to be in your inventory, like the “Kalnins” shown a while ago. These shoes are moddable, which allows you to tweak their size to fit your avie. After all these scripted shoes, I’ve become lazy and I have to admit manual adjustment of shoes is a bit tedious, especially when you are not used to it, and when it comes to making them both the same size (shrink or stretch them using the “stretch” mode and the white handles, check the size in the “object” tab but just don’t type the number there, you would ruin your shoes (linked objects don’t like direct input of numbers in these boxes). To avoid any issue, better do a backup copy of your original shoes, as they are copy-no transfer! I’m sure you will enjoy them as much as i did. CheerNo Destiny for “A.C. Store” has just released a new series of jeans “Jeans forever.” They offer some interesting features. As with many jeans now, cuffs are provided. I’m usually not fond of pants cuffs, but these rolled up cuffs can give an interesting and different look; plus, the sculpted cuffs are resizable by script, and synched with each other, so you have to adjust the size of only one of them and the other follows. No more tedious manual adjusting of prim cuffs which end with different sizes! This is a great improvement. 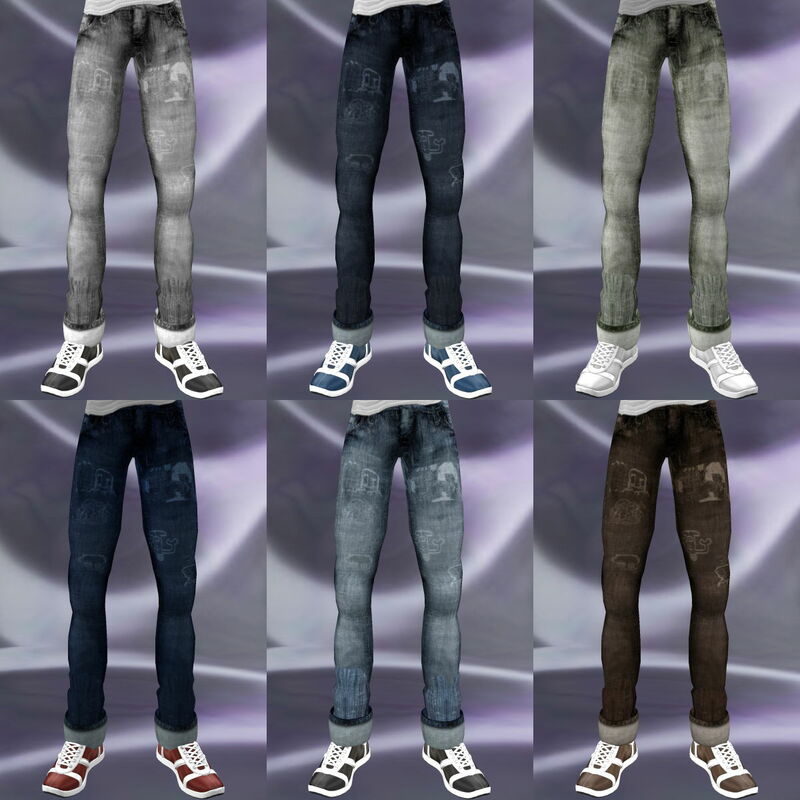 “Jeans Forever” come in 6 colors (shown below), some are really original like “modern” and “green” (a very pale green). Each color comes in 4 finishes (shown below), including an original “drawing” which is definitely my favorite. 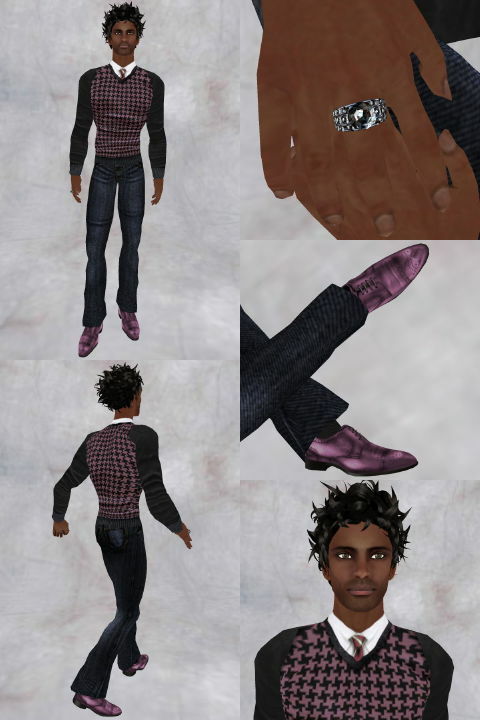 They are copy-no trans, moddable (cuffs aren’t moddable but are menu driven). 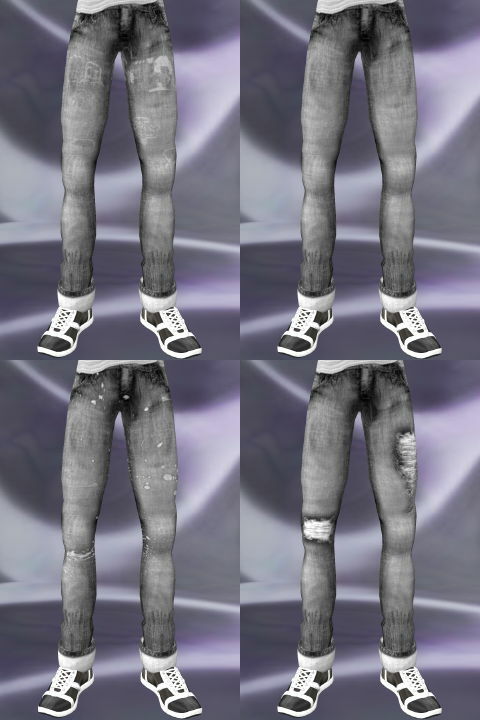 This one version is worth it, even at this price, but I’m more reserved about the “basic” finish: 230 lindens for a plain pair of jeans, even with sculpted cuffs, is a bit too much compared to what the competition offers for similar quality. One more new release for men at “Dutch Touch!” Iki Icarus is spoiling us, guys! She offers new sweaters with nice tone on tone stripes. They come in white, black and grey in no-copy-transfer version, or in a pack of 5 (including the colors sold separately) in a copy-no trans version. They come in both a tucked version (undershirt layer plus complement on the underpants layer), and untucked on the jacket layer. 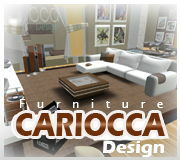 They show the usual “Dutch Touch” quality of texturing and coloring. The white one is my favorite, off white I should say, with pure white stripes. It is easily tintable to match any piece of clothing, but it looks gorgeous as is! I’m wearing it with a sleeve filler on the pictures, for a more comfy look. I’ve had in my inventory this series of bag from Proda Jie for “Shop Therapy” for a little while, but I haven’t had the occasion to show them to you until now. This “messenger bag” shows a very nice photosourced texture (Proda used his own bag as a source) with cool details like the iPhone. This bag comes in many colors and patterns. It is resizable by script and fits pretty easily. Note that Proda Jie has no shop in world for now, so I gave the SLX link where you can get them in the address page. [UPDATE] Shop Therapy is back online at BigStar! Go to this page for a direct tp [Designer & Address]. 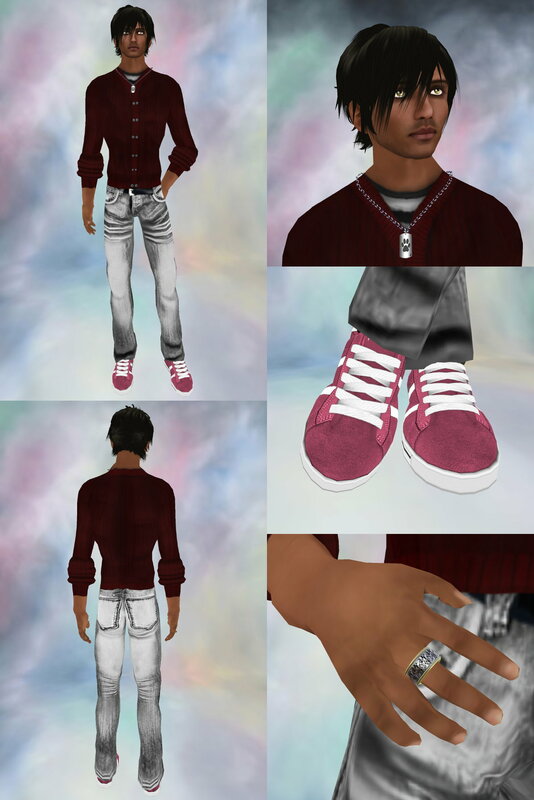 Also showing the perfect “Jaywalker” sneakers from “Detour,” one more new hair from “Exile,” Relentless shown in Mink, glasses from “Ottico,” and a ring from “Dahlinks.” Enjoy! Left to Right & Top Down: Drawing, Basic, Painted, Torn. Left to Right & Top Down: Grey, Black, Green, Indigo, Modern, Old.